Malcolm X changed the trajectory of my life. The Malcolm that I encountered in the Autobiography of Malcolm X transformed a bright but rudderless and somewhat bitter teen into a student of history. I no longer saw history as a dormant and static record of a long ago forgotten past that bore no relevance on my life but a dynamic force that is always present and that permeates, literally, everything. Yesterday shapes today – history is alive – we are its vessels. And sometimes, vessels break. Never to be made whole again. The Up Theater’s latest production, Broad Channel, is a play that is steeped in and shaped by history. The play tells the story of a struggling, working-class White family living in the Broad Channel neighborhood of Queens, just a stone throw’s away from the JFK Airport and with Hurricane Sandy looming ominously somewhere in the near future. These are the forgotten White people of New York City. 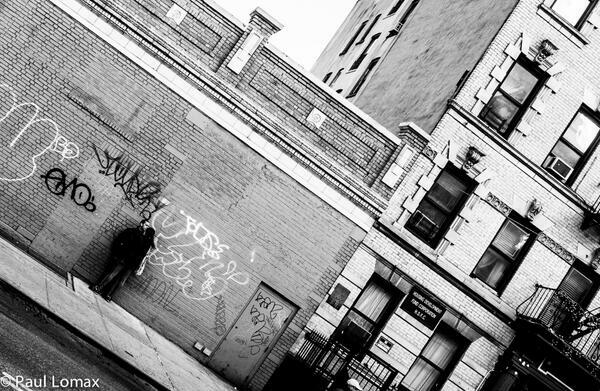 Broad Channel is not a play about the yuppies, hipsters and “gentrifiers”, enticed and swarming to the new New York but those folks that were raised, and still live, in the houses that their parents bought in better times, in the outer-borough fringes of empire. These are the people that progress, prosperity, and ultimately history, left behind. Masterfully written by James Bosley, Broad Channel, tells their story, warts, faults, frailties, xenophobia and all. This is not a pretty play. This is a serious piece of theater about real people soulfully singing the blue-collar blues. These are the kind of people that reflexively grab a cold brew from the mini fridge in the living room, when they get home from work every day. 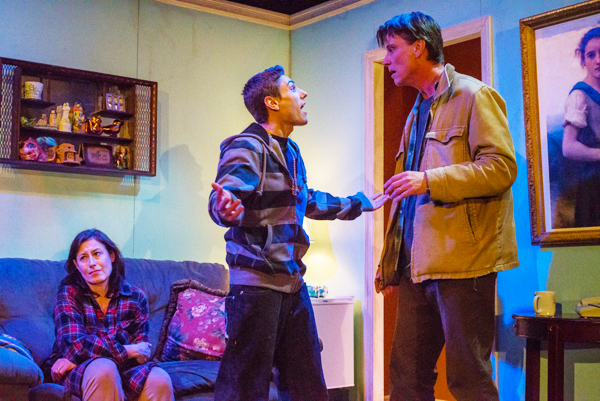 This play is as gritty, grimy, and at times, as graceful, as the people it portrays. It is also hilarious. I mean, REALLY funny. I found myself laughing, a little too hard, at some of the most inappropriate and politically incorrect utterances. 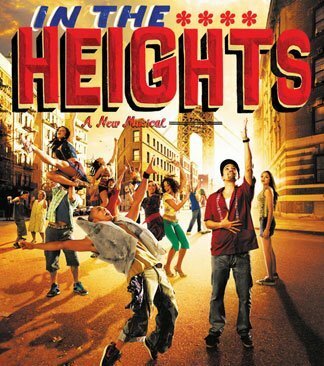 The father, Richie (Matt Higgins), is a permanently under-employed recovering alcoholic, that is striving mightily to be a better father and provider to his only child, Ralphy (Andrew Albigese), a troubled older teen with a penchant for getting himself into jams and disappearing for days on end. And then there is the mom. Smitty (Laura Fois) is the loud, domineering and boisterous breadwinner of the family. She, unlike Richie, does not struggle with alcoholism; she is at peace with hers. She also calls it how she sees it, regardless of the hell or high water, you sense is on its way. She is a woman of action, of cold calculation. She will do, what must be done, at all costs. Enter the painting. It is an unusually beautiful and angelic painting of a young French maiden that has held court in the living room with the mini-fridge, since Grandpa George brought it back from World War II. The painting is an out-of-place fixture that somehow has managed to keep at bay the worst of the tides of history. Grandpa believed until his dying day that it was the maiden that gave him the will to live when of one of his arms was blown off in the madness of historical proportions that was the 2nd World War. It was her that kept watch over him in the converted mansion that became a field hospital during the war. When he recovered, he took her back to Broad Channel with him as a talisman and a trophy of a valiant effort for a noble cause. Richie unknowingly opens the proverbial Pandora’s box when he puts the painting up for sale online. History is about to knock on his front door. It turns out that the painting is worth some serious cash. It is also art stolen from Holocaust victims by the nefarious Nazis. Helena (Elissa Middleton), a direct descendant of those poor unfortunate souls that perished in the death camps of Europe, wants her painting back and will only pay a meager finder’s fees to Richie, as she believes that she is the rightful owner of the painting. Helena feels smugly comforted by the fact that she has the money, means and legal recourses to get the painting back regardless. In her mind, she has history on her side. Not if Smitty has anything to do with it. 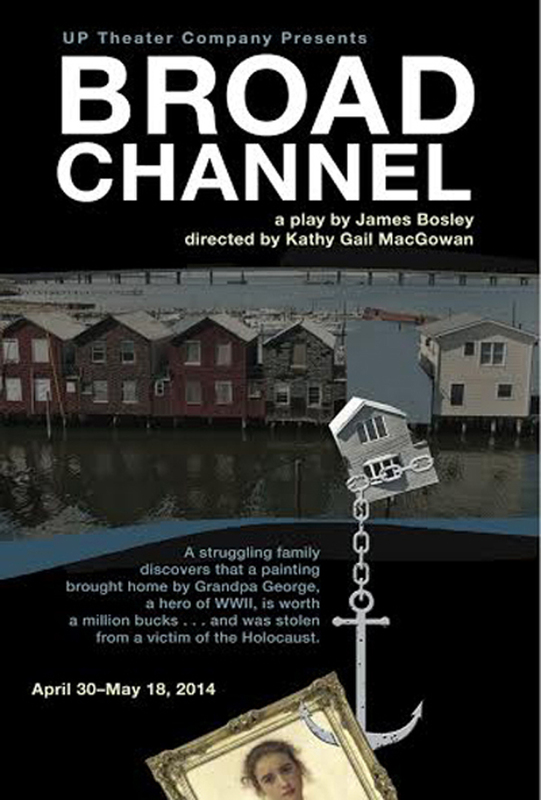 Brilliantly directed by Kathy Gail MacGowan, Broad Channel features some really accomplished actors doing phenomenal work that has substance, grit and texture. Rik Walters steals the show, doing double duty as Snyder, Helena’s artistic and legal hit man, as well as William Adolphe Bouguereau, an actual French painter who died in 1905 and who is supposedly the painter of the piece. Bouguereau’s brief and interactive cameo in the play was a stroke of theatrical genius. Who is right? Who is wrong? Who is the victim? Who is the victor? To whom does the painting belong? The answer is inherently subjective and depends entirely on your view of history. How history has shaped your life will probably determine on which side of the divide you end up in. What is for certain and not up for debate is that we are all irrevocably molded, shaped and sometimes shattered by history, struggle as we might against it. You have until May 18th to catch this slice of simply incredible theater so get your tickets below.